By law, every dog has to be registered in Shanghai. Dogs that have no license can be taken away at any time from the owner. Getting a dog back after it has been confiscated, is an extremely difficult task. Dogs are first brought to a police station and since there are many, it will be hard to find out which one your dog was taken to. Once the dogs are in the police station, it really depends on good luck. Trucks of the government shelter do rounds and it is hard to determine when exactly they will come to which police station. When your dog is picked up and taken to the government pound, it will be close to impossible to get him back. There are several pounds outside the city border, so its not easy to find out which one your dog was taken to. More over, these pounds are closed to the general public. And we won’t go into detail but best way to describe these pounds is “dog hell”. So please ALWAYS register and leash your dog, it just takes one phone call from one angry neighbour to have your dog taken away from you! The dog has to live with you at least for 10 days and showing no sign of disease (diarrhea/ vomiting). The dog has to be at least 12 weeks old. Puppies immune systems are not strong enough to accept the rabies vaccine before that. Certain breeds are not allowed. To avoid any problems, always try to register your dog as a mixed breed. Since 2011, you can only register ONE dog per household. Dogs that apply for their first license may do so at any time during the year. 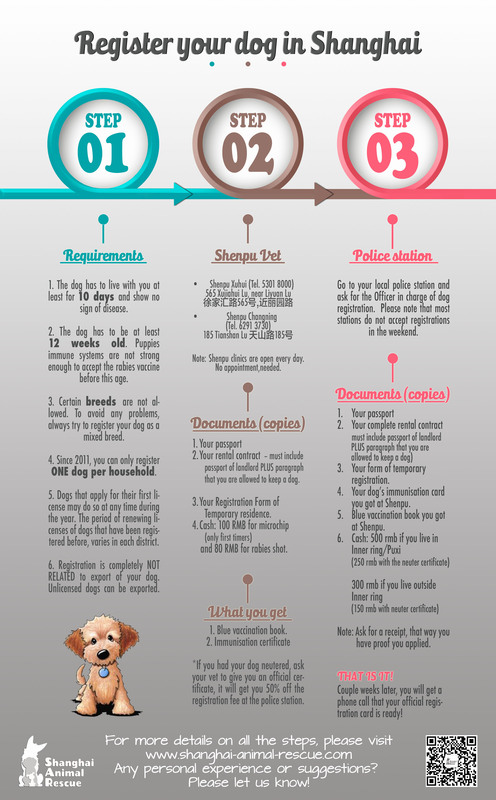 The period of renewing licenses of dogs that have been registered before, varies from district to district. Registration is completely NOT RELATED to export of your dog. Unlicensed dogs can be exported. Only few clinics are allowed to give the OFFICIAL rabies shot. 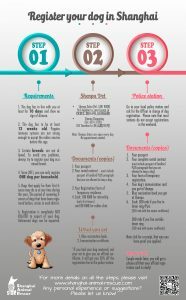 Check before if the vet of your choice is authorised to do so. If he is not, you will have to repeat the process and two times rabies vaccines in short period of time, can be harmful to your dogs health. As said before, Registration is for Shanghai law and is not connected to export. However, Shenpu hospital is the ONLY one authorised to give the rabies shot for export. So if you are ever planning to export your dog, use Shenpu for Registration. It will be one step less on the export procedure. This has nothing to do with the DHPPL vaccinations or Kennel Cough that dogs needs every year. You can get those at a vet of your choice. How odd as it may sound, the check of these documents all depend on the officer who will help you. I have had officers barely looking at my documents and I had others reading every document completely. Very important is to take copies of everything! Your complete rental contract or property deed (if you own your home) – must include passport of landlord PLUS paragraph that you are allowed to keep a dog. Your Registration Form of Temporary residence or Hukou for local citizens. Cash: 100 RMB for microchip (only first timers) and 80 RMB for rabies shot. *If you had your dog neutered or spayed, ask your vet to give you an official certificate of this, it will get you 50% off the registration fee at the police station. This might take you on a good walk. Not all police stations have a dog registration officer. But if you go to the station closest to you, they will direct you to the closest registration officer. Please also note that most stations do not accept registrations in the weekend. 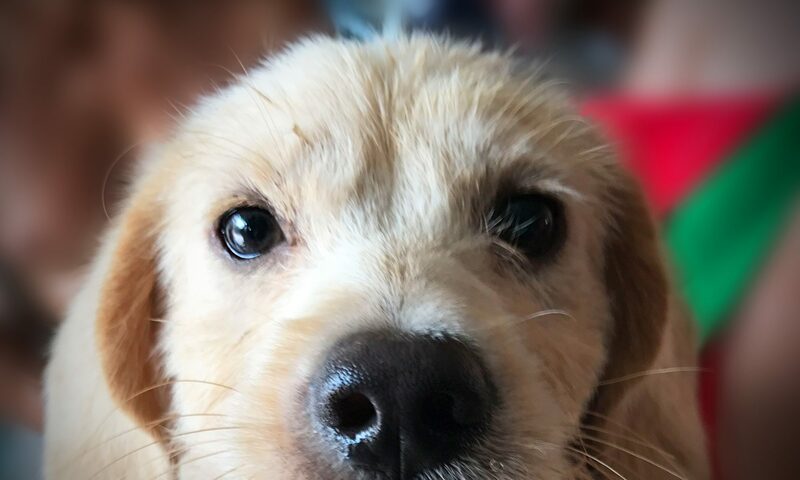 Cash: 500 rmb if you live in inner ring/Puxi (250 rmb if you have the spay or neuter certificate) 300 rmb if you live outside inner ring/Pudong (150 rmb if you have the spay or neuter certificate). Note: Ask for a receipt, that way you have proof you applied. Two to four weeks later, you will get a phone call that your official registration card is ready! Go get it and keep it with you at all time. Better safe then sorry!